Night shifts are bad for your health, and many of our members who work night shifts have been particularly concerned at the mounting evidence that night work is linked to breast cancer risk. In October an Oxford University study found that the classification of night work as a cause of breast cancer ‘is no longer justified. This sounded like good news, but three of the most respected researchers on night work and breast cancer have now said they “fully disagree” with this conclusion, noting a succession of methodological flaws in the research “invalidate” its conclusions. Johnni Hansen, a researcher with the Danish Cancer Society, added: “They base their conclusion on a poor study, but even worse is that their conclusion may hinder preventive initiatives for night workers.” Richard Stevens, of the University of Connecticut medical school, who has written influential papers on the topic with both Schernhammer and Hansen, was blunt. “Why was the paper written in the first place?” he asked. The main study groups in the Oxford study were “worryingly old”, with many over retirement age, and the follow up was “unusually short”, Hansen said. The risk of women developing breast cancer appears to wane in the years after night working ends, so studying retired workers without recent exposures misses the point and the cancers, said Schernhammer, adding the higher risk is seen in women with long exposures – at least 15 years – early in their careers. 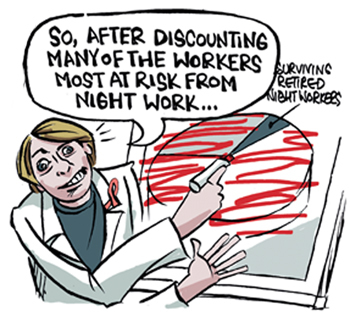 Night work was sometimes defined so loosely in the study participants, a single night shift might have seen a worker added to the ‘exposed’ group despite facing minimal exposure and risk. Read more about the risks in Hazards magazine. Unite reps and health and safety reps play an important role ensuring good practice in shift work.